I'm back with a vintage card today featuring the Chalk Talk Stamp Set that I'm entering into two card challenges. I don't create vintage cards nearly as often as I used to and they are lots of fun to create.. One of my favorite ways to create that vintage feel is using lace along with shading around the card edge. The colors also help set the tone on the card. The challenges I'm entering this card into are the Crafty Gals Corner Challenge #7 which is a bingo challenge and the As You Like It Challenge. As I mentioned in a previous post a few weeks back, one of my goals this year is to be more active in online Card Challenges so I decided to go on the hunt for some different challenges. I really loved these two challenges since the met my criteria for participation and who doesn't LOVE a good game of BINGO! For the Crafty Gals Corner Challenge #7 you had to choose one row from the Bingo Card shown below. I choose to use the 2nd row by creating a Vintage feeling card using Lace and Flowers. I really do love how this card turned out. The card base is Whisper White with the card front starting with a layer of Crumb Cake then Rose Red and another layer of Whisper White stamped using the Something Lacy Background Stamp from Stampin' Up! with Sahara Sand Classic Ink. I love the look of the Something Lacy Background Stamp which is absolutely perfect to set the tone for a vintage feeling card. Next, I sponged around the edges using Crumb Cake Classic Ink – another layer of "Vintage." One of my favorite "Vintage" techniques is to use lace and create a "rouched" or gathered effect. The Sahara Sand Lace Trim is absolutely gorgeous when gathered on the card front. I actually did a double layer of the lace! Yep, I'm in love with this lace trim and already need to order my 3rd roll in less than a month! The main image features the Chalk Talk stamp set. I used the "vintage" tag which is stamped with Rose Red Classic Ink then I stamped the "For You" using the Pear Pizzazz Classic Ink and punched it out with the 1-3/8" circle punch to layer over the tag. The tag is layered with Rose Red card stock which I then positioned on the card front in the upper left corner overlapping the lace trim. So, I only had one element missing… Flowers! The flowers on my card are stamped again with the Rose Red and feature the Flower Shop Stamp Set with the coordinating Pansy Punch. Each flower petal was curled using a bone folder then the flowers were positioned on the card to highlight the sentiment. Behind the flowers I added the leaves which were cut using the Bouquet Bigz L Die. In the center of each flower, I placed a Very Vintage Designer Buttons with two buttons having the Linen Thread just threaded through for a cleaner look and the last flower having a Linen Thread Double Bow. Pearls… For the final touch, I just had to add some pearls. When I think of a classically vintage item Pearls just jump into my mind. Think of it as that classic touch finishing off a gorgeous and elegant dress. So, there you have it! The card that I created for the Crafty Gals Corner Challenge featuring this Bingo Card! I really did have fun with this challenge and I hope you have enjoyed this classic, vintage card featuring Lace & Flowers. To purchase the products to created this fun and beautiful project, visit my 24/7 Stampin’ Up! store by clicking HERE! For your convenience, you can find the supply list with product numbers listed at the end of this post. I invite you to pin any of my creations to Pinterest and to share your thoughts or questions by leaving me a comment. I love hearing from all my readers – word of mouth is one of the greatest forms of flattery. Do you enjoy making similar handcrafted items? Not a Stampin’ Up! Demonstrator? DO you enjoy FREE products? Join Stampin’ Up! and my Sunny Crafting Crew now. 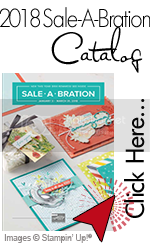 It is a great time to become a Stampin’ Up! Demonstrator. To sign up as a demonstrator and join my team, click HERE! Vintage and lace – you're speaking my language! I adore this shabby chic card and that lace is really cool! I'm going to have to remember the ruched effect because I really like the way it looks. Thanks for linking it up to Crafty Gals Corner this week! Beautiful card!!! Love flowers. Thanks for playing along this week at Crafty Gals Corner!!! So pretty! I love florals! Congratulations on your win this week at Crafty Gals Corner!